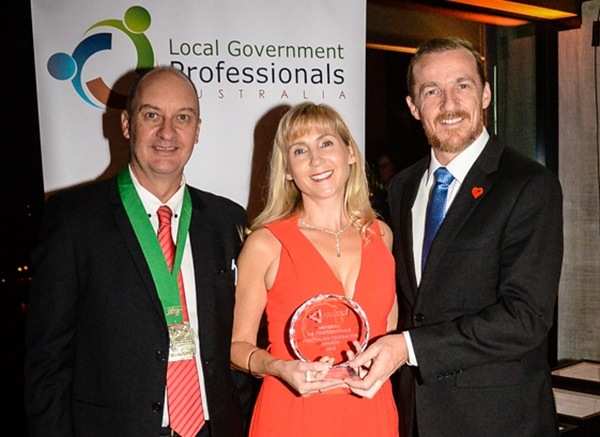 The award was presented in Canberra on 23 August in the ‘Community Partnerships and Collaboration’ category. Mayor Isaac Smith and Environmental Strategies Officer Sharyn Hunnisett, who has worked tirelessly on the project for many years, were there to accept the national honour. As part of the Lismore Community Solar initiative, Council built Australia’s first Council-owned and community-funded solar farms – a 100kW solar farm at GSAC and a 100kW floating solar farm at the East Lismore STP (the largest floating solar farm in Australia). The floating solar farm in particular was a complex project using new technology. “I want to say a special thank you to all the community investors who were a big part of this win. It was the first community solar partnership in Australia and we have loved working to make this partnership a reality,” Sharyn said. “It has not been without its challenges though. We originally had space restrictions and then when we decided on a floating solar farm we found ourselves working with technology that had never been used in Australia and presented some difficulties. Many departments in Council had to work together to solve problems and overcome obstacles to make this a reality and the staff deserve recognition for their enormous effort.